Stroll down a quiet lane in the Bedfordshire village of Blunham and you might take a second look at a house that catches your eye. The house was built by Fairfield Homes and features a precisely executed coloured zinc roof and cladding which takes your breath away. And Neil is right. The soft tones of the brick and tiles of neighbouring houses are echoed but not aped by the natural stone of the lower floor of the new house, and the crisp, modern yet respectful detailing of the elZinc Rainbow Red cladding which sweeps up over the roof and envelops the house in a warm glow. This is a large house – some 2850ft2 of four bedrooms and five living spaces including a dedicated cinema room and an upstairs snug. For Neil Shepherd this was always part of the plan. The house is a step up from a standard new house build. “The external and internal finishes are a very high specification, executed to a very high standard. This makes the house an ideal example to show customers who want a new home built, just what Fairfield Homes can do,” he explains. Indeed, the house also features a comprehensive fit out using Control4, the market leader in the UK for home automation. The scheme includes the ability to control lighting scenes, heating and cooling, window shading and video and audio distribution in eight different zones around the house by means of a number of interfaces, including keypads, wall screens or even a mobile phone. “The family can watch Netflix, Sky and Apple TV, all at the same time if they want!” An integrated alarm and CCTV system rounds off the spec, enabling lighting to be controlled not just for energy conservation and entertainment, but also for security. Why use elZinc Rainbow Red? 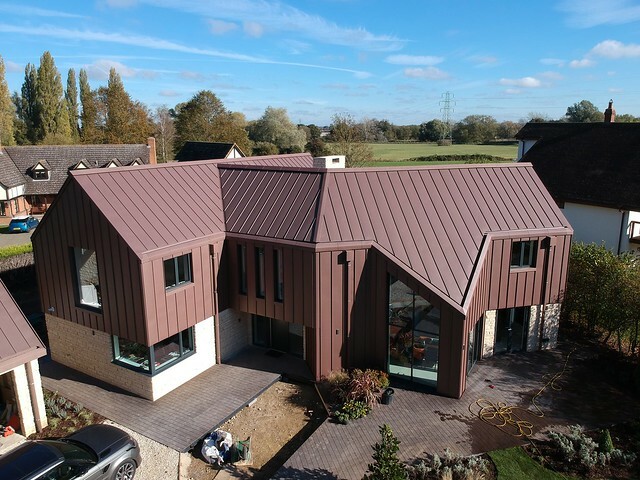 From first concept, the architect always wanted the house to have metal cladding, and visualisations at planning suggested a brown tone. However, Neil didn’t want to use copper which would weather differently across the roof and change appearance over time. 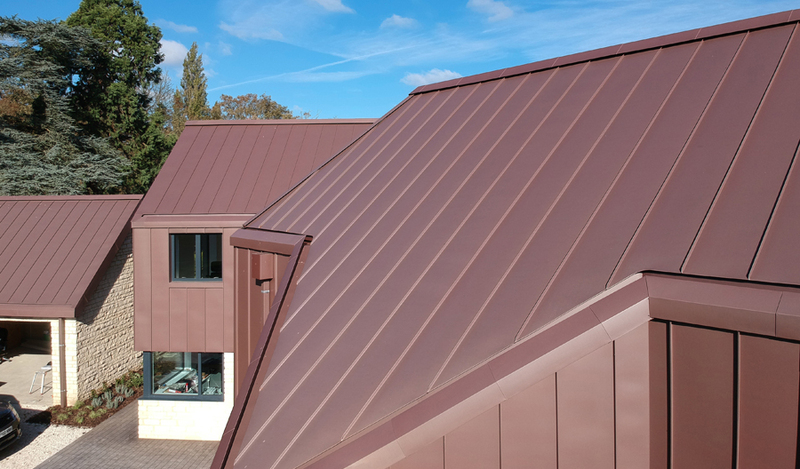 Both elZinc Rainbow Brown and Rainbow Red were considered, but Red was chosen for being a lighter, chocolate brown which performed well across the spectrum of daylight from grey dull days to bright sunshine and reflected the pantiles and hanging tiles on neighbouring houses. 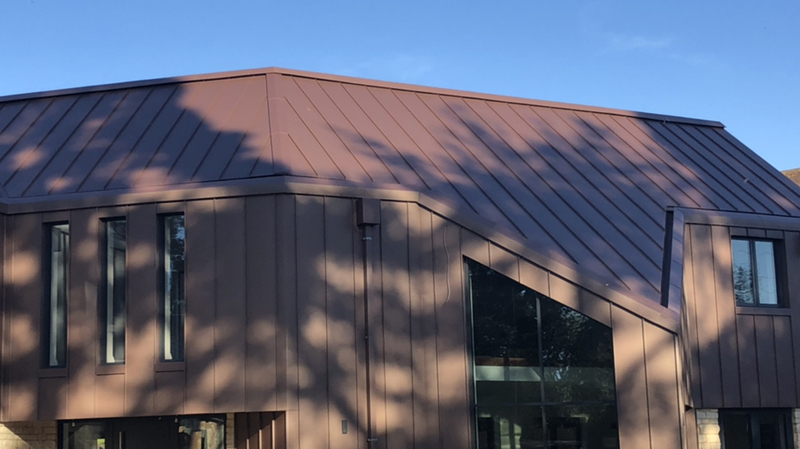 The beautiful standing seam zinc roofing and cladding was installed by Richard Lavers’ experienced team at RFL Metal Roofing. One of Richard’s biggest challenges was to ensure that all the standing seams lined up between roof and cladding, and with the window reveals, a challenge well met as you can see. The vented low level ridge detail. Stonework has a very uneven surface, and as architects are aware, making joins between very crisp materials and uneven materials is a challenge. 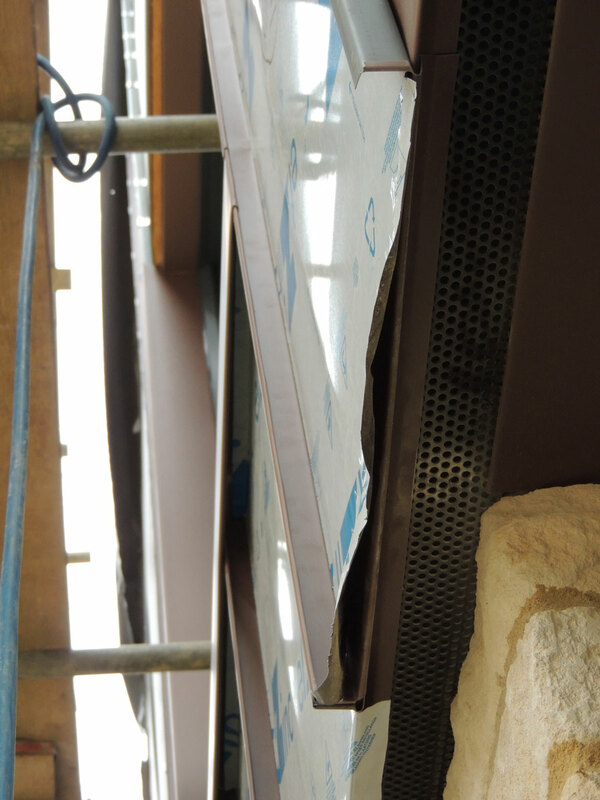 Rather than try and scribe the cladding into the stone, the two materials are kept apart, and a black polyester powder coated aluminium mesh is slid into a chase cut into the stone cladding. This gives the edge a very crisp finish with no sealant required. 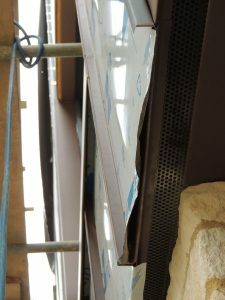 Behind the mesh, a fabricated lining plate hides the top of the timbers, completing the tidy effect whilst providing a ventilation gap all around the building. The eaves gutters are pulled back from the eaves to create a shadow gap along the edge of the roof and free the eaves up from rainwater collection, thereby contributing to the effect of the cladding running over the roof. The detail for the hidden gutter is a standard elZinc detail, adapted to be slightly wider to allow for RFL’s teams’ soldering equipment. An upstand to the rear prevents wind-blown water from entering the roof, and the lower edge has a 75mm upstand and a turnout of 30mm flush with to the line of the capping, which hooks onto the side of the gutter. Richard explains that there are no steps in the gutter, they are single falls on all elevations, jointed with expansion joints as required (but not exceeding 6 metres). All the downpipes are exterior as well, with the exception of the point at which the roof dips right down into a spectacular V shape. 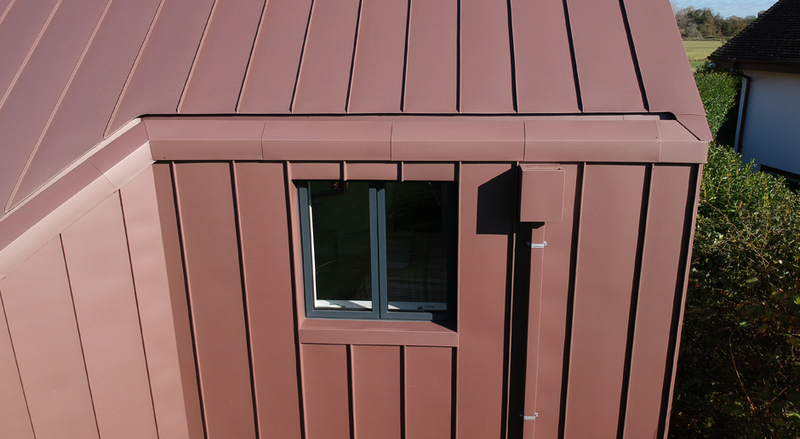 Finally, to complete the effect of ‘up and over’ roofing and cladding in one, the ventilated ridge detail was also adapted to ensure it was as low as it could be, whilst providing the necessary ventilation. The detail is similar to those which use a foam gasket, but Richard believes it is superior, providing better airflow. 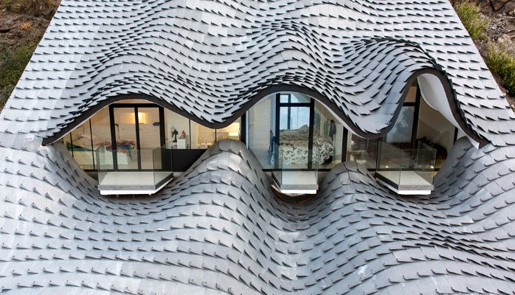 The detail is formed by a partial clip 200mm wide, made of 1mm formed galvanised steel. This sits on the ridgeline every 400mm, above the rafters, and is screwed into the substrate. A continuous galvanised plate gives full cover of the roof sheet on either side, and then the elZinc ridge cap locks everything into place with a continuous airgap. Under the ridgeline the roof covering has a 65mm upstand and a 20mm turnout at the top, which stops any driving rain. The result is a neat, low finish without any compromise on ventilation. 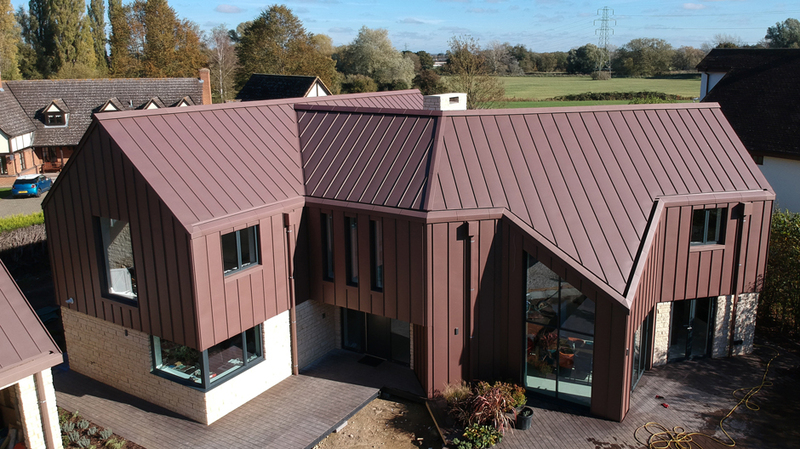 For a small project, the house at Blunham is a lot of work – 600m2 of zinc, which is 4.2 tonnes, four valleys and plenty of important detailing to execute perfectly. But Neil Shepherd is delighted with the result. “The process took a lot longer than I was anticipating, which was frustrating, but understandable with a project like this. As a housebuilder we are used to working quite quickly, but I do now appreciate why it took so long. The zinc comes in rolls and everything you see on the house, the square downpipes, hoppers, MVHR cowlings, are all handmade. Use our Product Finder to choose the right metal for your project.